For the owners sense of well-being and the yachts overall usability, the interior design is as important as the technical architecture and the exterior. I put special emphasis on the harmonic confluence of all stylistic features. Being a professional industrial designer, I strive for a balanced solution merging esthetic and functional gain to its optimum. For instance, it would be desirable to always have the same radii for plywood glue-forms, allowing to be used in different places repeatedly and for the interior design of the next model also, thereby reducing manufacturing costs. There are way more possibilities of making a design modular and I preferably opt for such solutions. 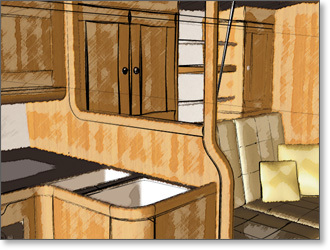 Final interiors are constructed using state-of-the-art software technology, making it possible to transfer the designs directly to your CNC-based rapid manufacturing process. This gives highest accuracy of fit and allows for straightforward assemblage. If you prefer to work with conventional 2D-drawings, these can be provided as well.